If you’re among the loyal Paneristi who’ve been patiently waiting for your favorite brand to take the plunge into blue-dial timepieces — one of the watch world’s most popular style trends of recent years — your wait is nearing an end. Panerai Replica has unveiled four new versions of existing models, each featuring a blue dial with eye-catching satiné soleil finish inspired by the rays of the sun on ocean waves (as well as by the brand’s naval history), and all available exclusively in Panerai boutiques worldwide. The four new blue-dialed Panerais are line extensions of two Luminor models — the Luminor 1950 3 Days GMT Automatic Acciaio and Luminor 1950 10 Days GMT Automatic Acciaio — and two Radiomir models, the Radimoir 1940 3 Days Acciaio and Radiomir 1940 10 Days GMT Automatic Oro Rosso. All of the replica watches are presented in blue cherrywood boxes, which also contain a second rubber strap, a strap-changing tool, and a screwdriver. 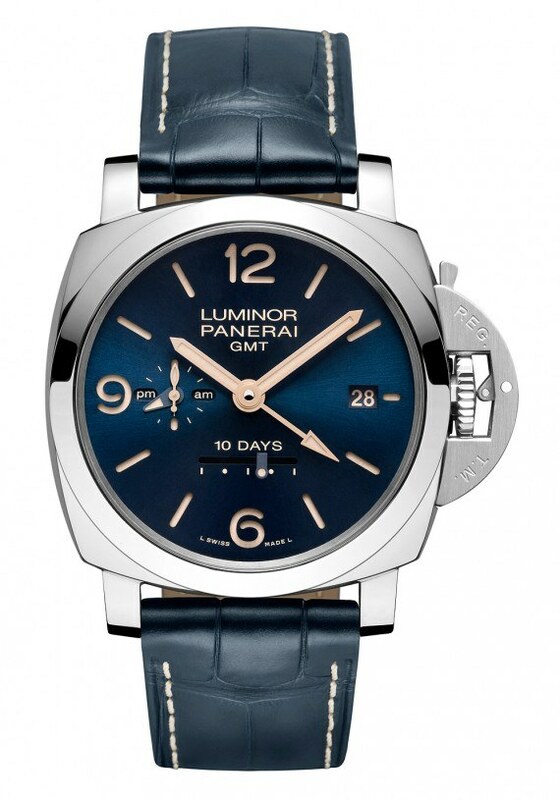 The Panerai Luminor 1950 3 Days Acciaio – 42mm (Ref. 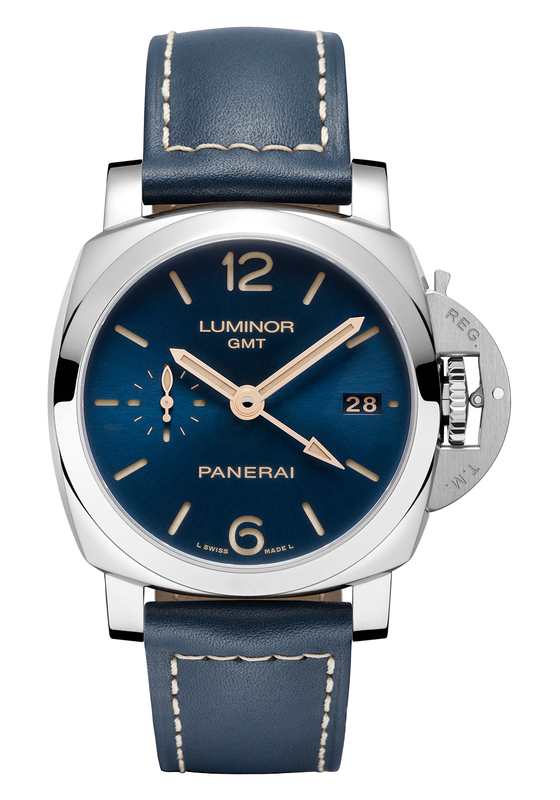 PAM00688) matches a blue leather strap, with contrast ecru-colored stitching, to its shiny blue dial. The 42-mm-diameter case is in 316L polished stainless steel and includes Panerai’s patented, crown-protecting bridge device, which helps ensure the swiss replica watch’s water-resistance of 100 meters. Inside is Panerai’s automatic Caliber P.9001, which powers the hours, minutes, small seconds at 9 o’clock, date indication at 3 o’clock, a GMT function via a central arrow-tipped pointer, and an indicator for the three-day power reserve on the back side of the movement, which is visible through a clear sapphire caseback. The movement is also equipped with a seconds reset function that stops the balance wheel and zeroes the seconds hand when the crown is pulled out. Price: $8,600. The blue-dialed version of the Panerai Luminor 1950 10 Days GMT Automatic Acciaio – 44mm (PAM00689) — also featuring a a dial-matching, stitched blue leather strap — offers a larger case size, a longer power reserve with a dial-side indicator, and a travel-friendly AM/PM display. Its 44-mm, corrosion-resistant steel case contains another in-house Panerai movement, Caliber P.2003, which stores at least 10 days’ worth of winding autonomy in its three spring barrels. The satiné soleil blue dial is formed in Panerai’s “sandwich” style, with two superimposed disks and a layer of ecru-colored Super-LumiNova shining through the top disk’s large, stencil-style, cut-out Arabic numerals. The date window is at 3 o’clock, the linear power reserve display at 6 o’clock, and an AM/PM indicator sharing the 9 o’clock position with the small seconds subdial. As on the 3-Day Luminor, a central arrow-tipped hand indicates a second time zone on the 12-hour scale, and the crown is secured by the bridge crown protector device. Price: $13,400. 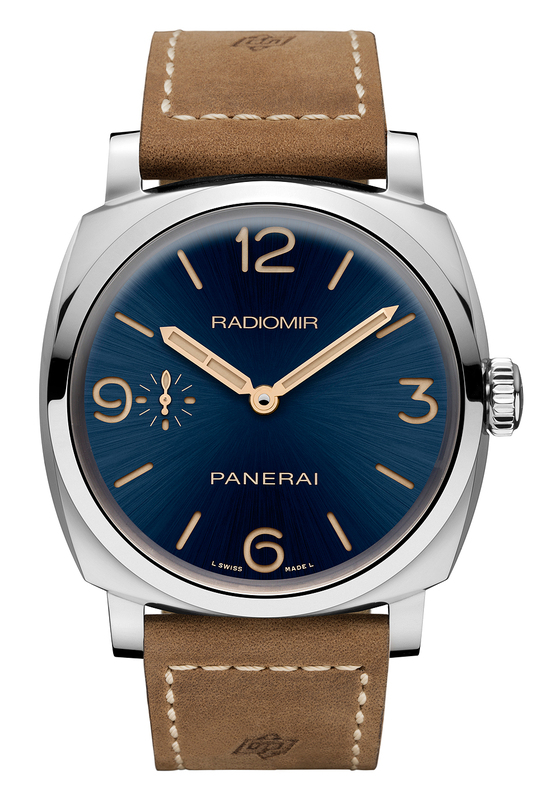 The larger and more classically simple of the two new Radiomir models, thePanerai Radimoir 1940 3 Days Acciaio – 47mm (PAM00690) is the only one without the monochromatic blue dial/blue strap look, opting instead for a an untreated leather Assolutamente strap with contrast stitching and a hot-pressed Officine Panerai “OP” logo. The 47-mm polished steel case is true to Panerai replica watches of the 1930s and ’40s. The shimmering, sandwich-style azure dial features large Arabic numerals, small seconds at 9 o’clock, and gilded hands coated with ecru Super-LumiNova. Powering this vintage-inspired timekeeper is Panerai’s manual-wind P.3000 movement, visible through the sapphire caseback and offering a three-day power reserve from two spring barrels. The movement’s extra-large balance wheel is secured by a bridge with twin supports; it is also equipped with a device that can quickly adjust the hour hand backward or forward without interfering with the minute hand, thus enabling the wearer to change the time zone quickly. Price: $9,200. 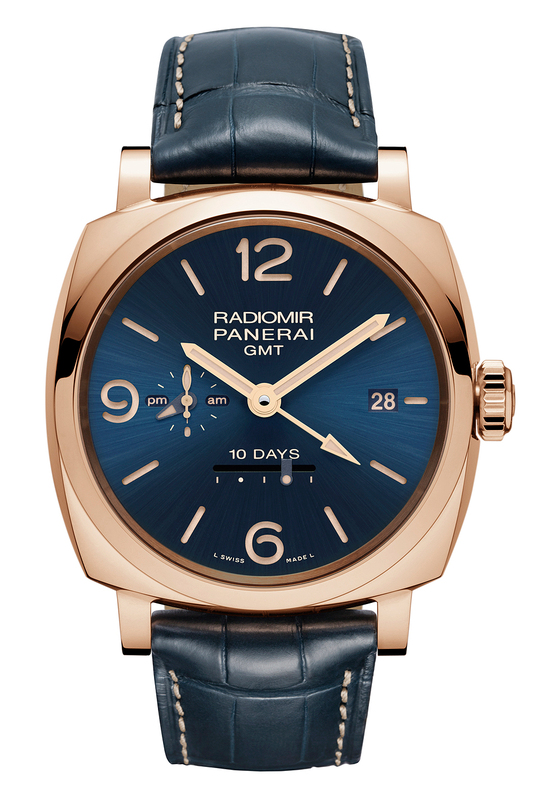 The final new blue-dial model, the Panerai Radiomir 1940 10 Days GMT Automatic Oro Rosso, is the only one in a precious metal case. The 5NPt rose gold (oro rosso) used for the watch’s 45-mm polished-finish case is an alloy with a high degree of copper, which imparts a warm reddish tone, as well as a smattering of platinum, which aids in preventing oxidation. The watch contains Caliber P.2003/10, Panerai’s first skeletonized in-house movement, which featured automatic winding, a frequency of 28,800 vph, 25 jewels, and three spring barrels to accumulate a 10-day power reserve. The functions it controls are central hours and minutes; small seconds at 9 o’clock, along with an AM/PM indicator; date at 3 o’clock; central GMT hand to indicate a second time zone; and a linear power reserve indicator at 6 o’clock. A sapphire window in the back of the case enables a view of the movement, with its openworked bridges and barrels and bidirectional winding rotor with “Officine Panerai” cut out along its outer edge. Price: $35,900.